Our mission is to treat each patient as a complex individual with emphasis on overall wellness rather than one disorder at a time. Our goal is to enhance, maintain, and restore your health, beauty, and sense of well being. We provide comprehensive healthcare for women including surgery, reproductive and infertility treatment, menopausal health, and reconstructive surgery. Our clinic is a state of the art facility where every effort is made to provide you with the attentive care and comfort you deserve and expect from your Obgyn. It was great. She was very welcoming and made me feel extremely comfortable. Whole experience was excellent. No waiting, lovely doctor and staff, upscale office in convenient location. 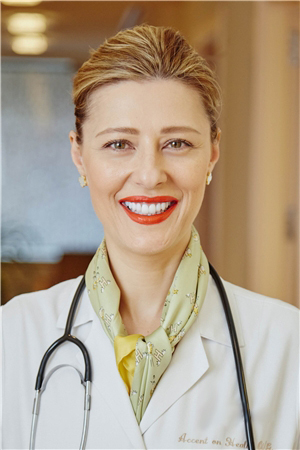 Dr. Meimaris, certified by the American Board of Obstetrics & Gynecology, is the founder of Natalia Meimaris, MD., and a Clinical Assistant Professor of Obstetrics and Gynecology at New York University School of Medicine.